Recently in the library of Sydney fringe culture collector Jamie Leonarder I came across a title that caught my attention. 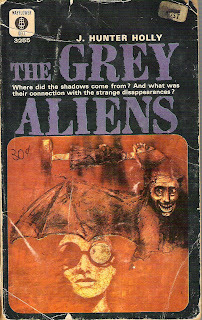 It was a 1964 English paperback entitled "The Grey Aliens" (Mayflower UK) by J. Hunter Holly. 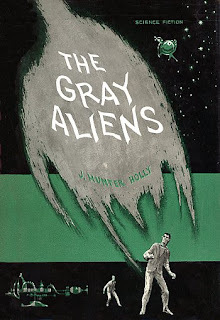 It was originally published in the US as "The Gray Aliens" in 1963 by Avalon Books. It was a science fiction novel with a strange alien abduction twist. People were being taken by "the shadows - the grey aliens! The ghost makers". Well the novel was readable, but I was more interested in the title - "The Gray Aliens". The term "gray alien" is iconic in UFO alien lore, but the grays of UFO encounters were generally understood by researchers to be a more recent manifestation largely sharing the chronological trajectory of alien abduction claims - becoming most prominent during the 1980s. The now familiar gray alien appearance while hinted at in some of the earlier entity encounters of the fifties, sixties and even the seventies, did not seem to emerge out of the shadows in full iconic gray form until the 1980s. Earlier encounters described retrospectively seem to include the "grays" but in a contemporary sense with books like "The Humanoids" edited by Charles Bowen (1969) and "Flying Saucer Occupants" by Coral and Jim Lorenzen (1967) descriptions that fully equate to the current imagery of the grays are missing. Why?